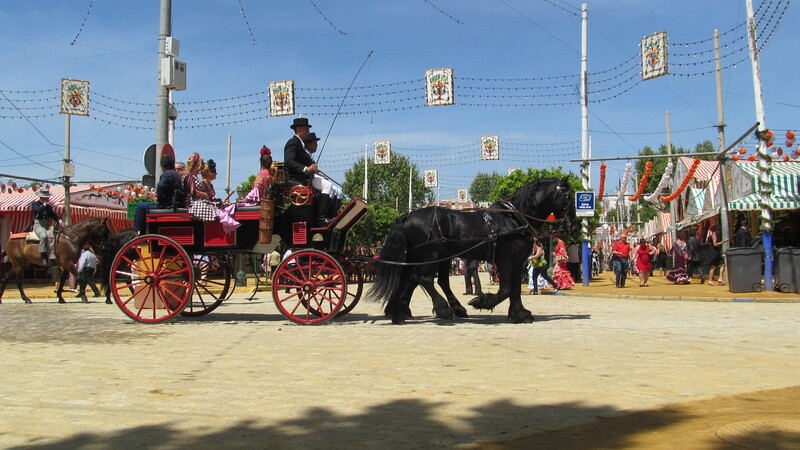 I went to the fair yesterday in Seville, took the high speed train, 250 kilometres per hour, through las huertas of the valley of the Gaudalquivir, one of the five major rivers of Iberia, joining together and feeding Córdoba and Seville. 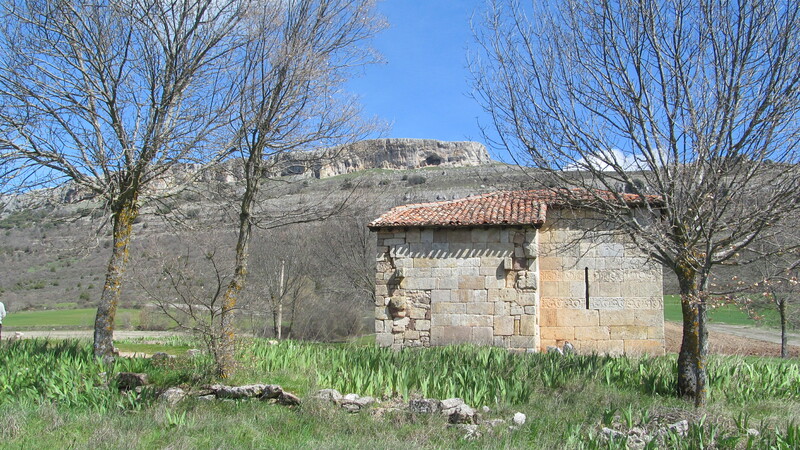 Las huertas surround every city, town and village in Spain. They are the market gardens and orchards that feed the local population. In the villages, of course, they are simply the private and community gardens of the locals. 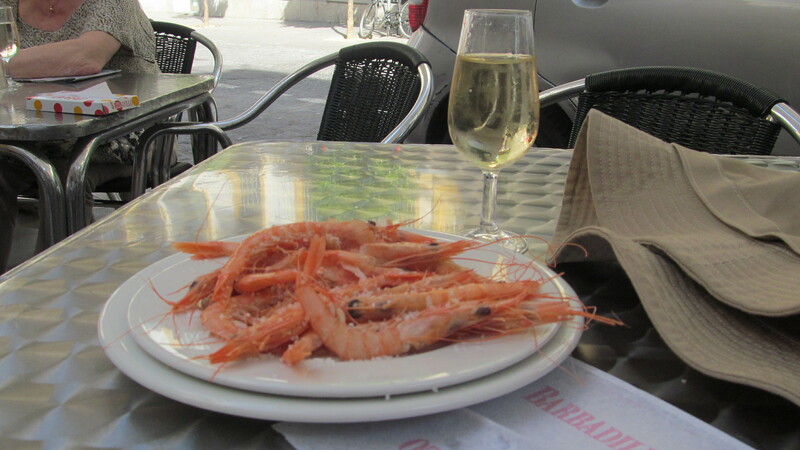 Through the centuries, these cities had to be fed locally and Spain has ample good land and the weather to eat locally. The 5 kilometre diet! I did not recognize them at first, orchards with later maturing dates, but then it was clear. 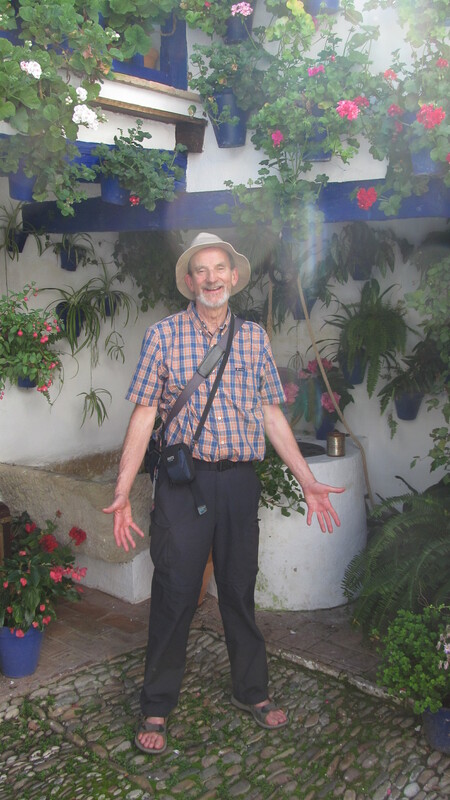 I was surrounded by orange groves, stretching out in all directions, not quite as extensive as the olive groves between Córdoba and Granada, a bushy, dwarf variety to make the harvest so much easier. Now I know the source of my morning, and at times, afternoon freshly-squeezed orange juice. 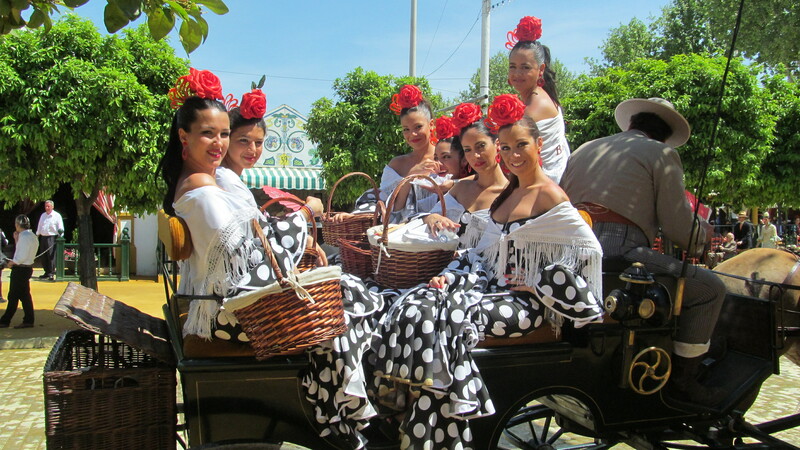 The Feria, ‘fair’ sounds prosaic for this event, takes place every spring and dates back to the mid 19th century, but comes from much older traditions. The focus is horses and carriages and Sevillanos parading throughout the afternoon, continually from around 2 to 8 o’clock. I’ll start with a video; I was comfortably sitting in the shade on the ground, enjoying the passing show. 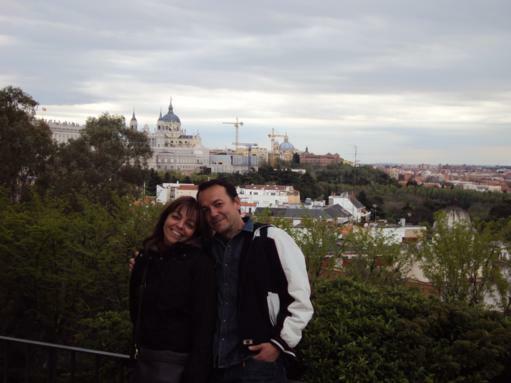 There is a popular expression in Spain, dar paseo, simply means to go for a stroll. But strolling is a fine art here, practiced down through the centuries, particularly in the cool of the early evening and on weekend afternoons. To be out and about, to be seen out and about, and to notice your neighbours who are out and about. (I am from the Valley, you know!) And dressed to the nines. 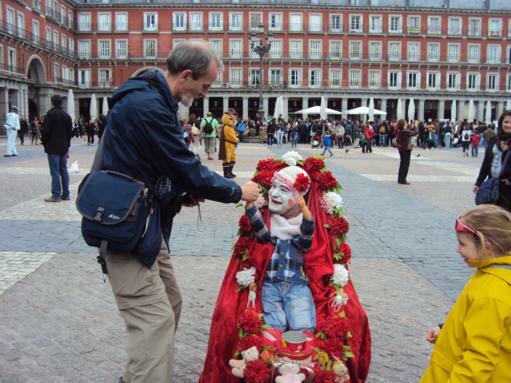 The Spanish and Madrileños in particular have quite the reputation for the necessity of making a good impression. The Feria is clearly a variation of this. 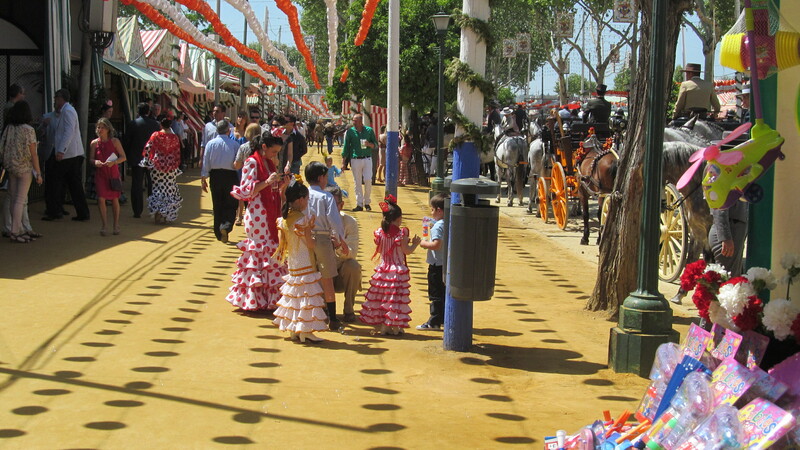 The horses and carriages, of all descriptions, dan paseo through the avenues of the Feria site, a large permanent site, the equivalent of 15 to 20 normal city blocks. Casetas, not homes or shops, line these streets, meeting places for eating, drinking, singing and dancing throughout the afternoon and well into the evenings of this week-long event. The carriages with their passengers simply circulate on a prescribed route for as long as they desire throughout these afternoons. No sense of a competition. 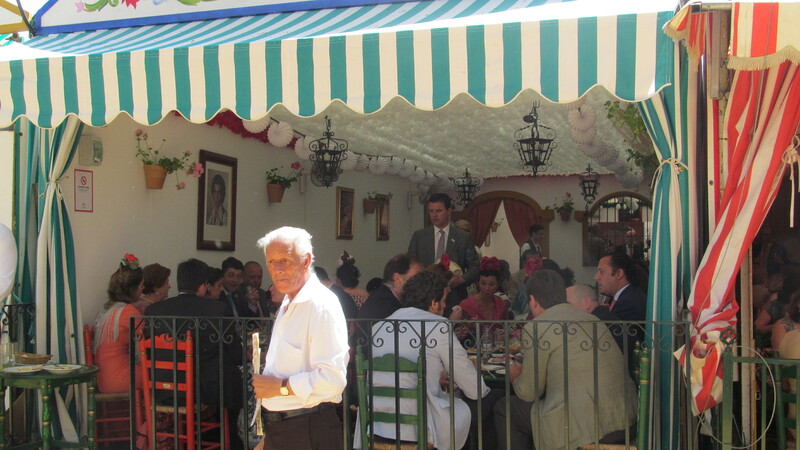 Gradually the casetas fill up; most are private, associated with clubs, associations, societies, whatever. Enough are open to the public. 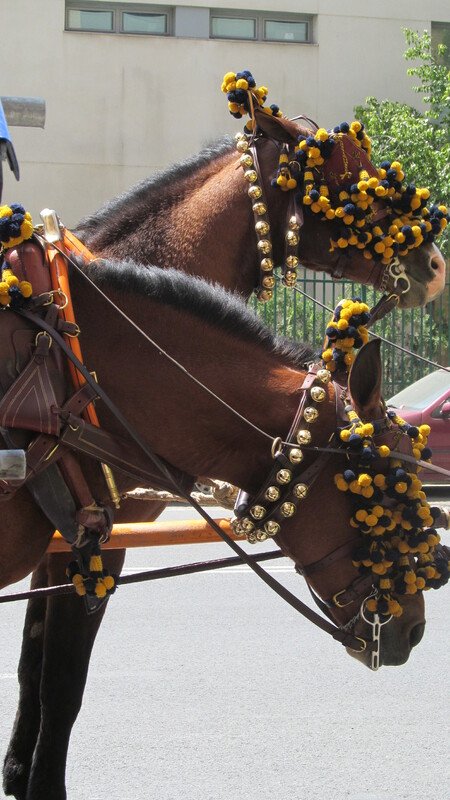 The horses wear distinctive head decorations of different colours and often bells; close your eyes and ignore the heat and it is time for a sleigh ride. Just kidding! 35 degrees! I’m delusional. They come in all colours; my favourite were the teams of black ones, short, not many hands high, and with amazing tails. 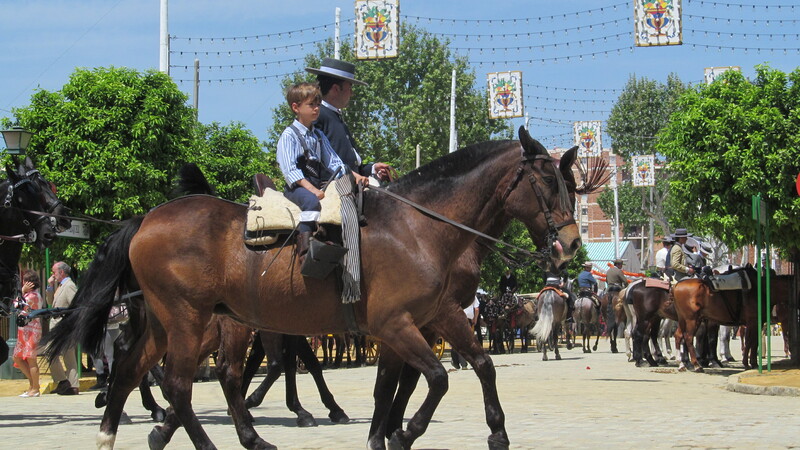 Breeds of horses developed since the time of the Caesars for conditions in Spain. The men wear their traditional outfits, a short to mid-torso jacket, tight pants that come up to mid-torso (a curious look), leather boots (at times, leg chaps), and a distinctive hat. We are probably more familiar with this look from what we know of ranch culture in Argentine. The ships to the New World left from Seville, the river was navigable in those centuries, and the people of Andalucia would have been prominent in the waves of Spaniards heading out to make their fortunes and to find new lives for themselves. The young son continuing in the tradition of his father and grandfathers, anticipating many years of the Feria in Seville. 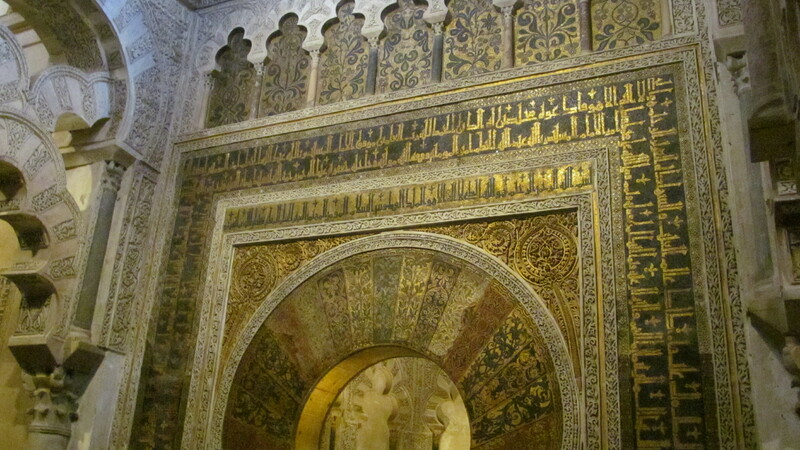 And the women of Sevilla are in their absolute glory. A whole carruaje full, all dressed alike. Inevitably there are shops devoted to this style; El Cortés Inglés, the very upscale national chain of department stores, has its own department. A young woman I met on the train back to Córdoba, from Jerez, the home of sherry (how the Brits dealt with the pronunciation of the town – phonetically, Hay (very aspirate)-raithe, proudly showed me a photo on her phone of her outfit. Some even made it up to sit behind their novio – always discreetly side-saddle. A feeling of comfortable joy permeated the grounds, an affirmation of a culture that has endured for centuries and will continue to endure into the future. Happy to be an observer, clearly aware that I was in the presence of interconnecting, overlapping families, societies, parishes, neighbourhoods, villages, etc. 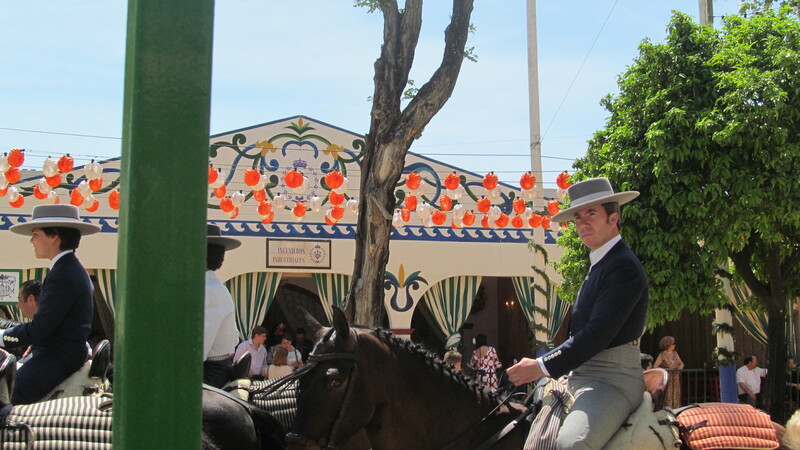 Each seemed to be very present and probably very much mindful of their lifetimes of coming to the Feria. Nothing needed to change, to be different from all the years before. We can get so caught up in the ‘I wonder what’s new at the…..’. Tonight I am going to an equestrian show at the Royal Stables and then a special nocturnal tour of the Mezquita. This entry was posted in Uncategorized on April 20, 2013 by agnotarte. Córdoba has welcomed me. There are almost too many things to see, monuments, museums, parks, historical neighbourhoods, local specialities in the restaurants, artisans, special attractions. 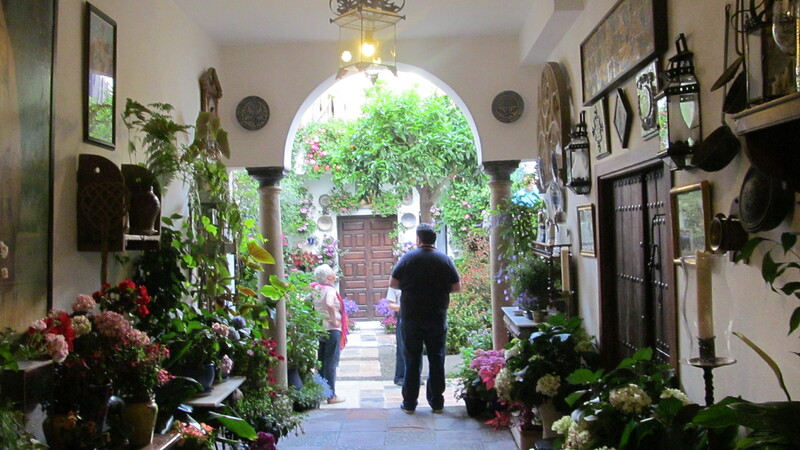 My hotel is in the ancient barrio of narrow lanes, a warren of walkways, occasionally interrupted by a vehicle that has been allowed through, and lined with walls of the houses and shops. Along any of these quieter ones, closed doorways do not betray what is hidden behind them, some very old and almost forbidding, others more contemporary but alluding to the past. 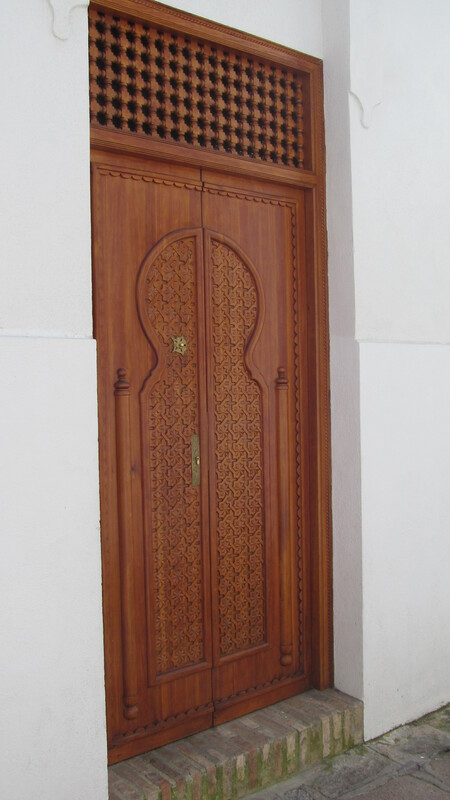 That is definitely a Moorish horseshoe arch and the fine woodworking detail reflects the ancient Islamic art seen in the many doors of the Alhambra and in many a Christian church. If the family is in residence, the doors are opened in the morning to reveal an entrance hall and a tantalizing glimpse of what is behind the wrought iron gate. 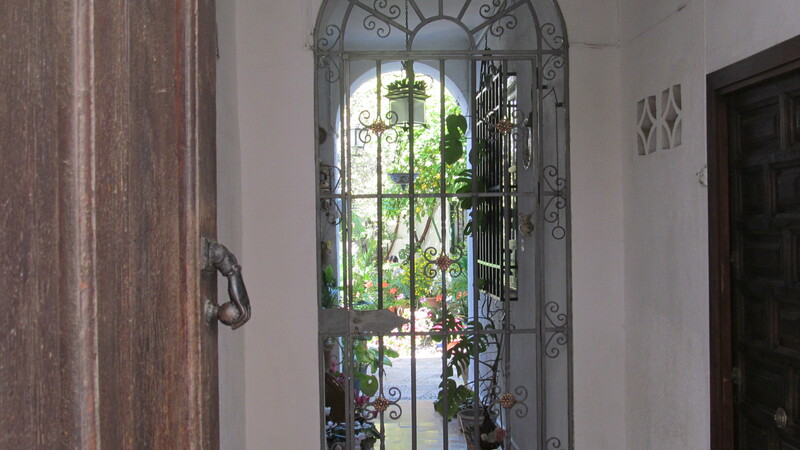 A traditional Cordoban inner sanctuary, un patio, around which the rooms of the home radiate. 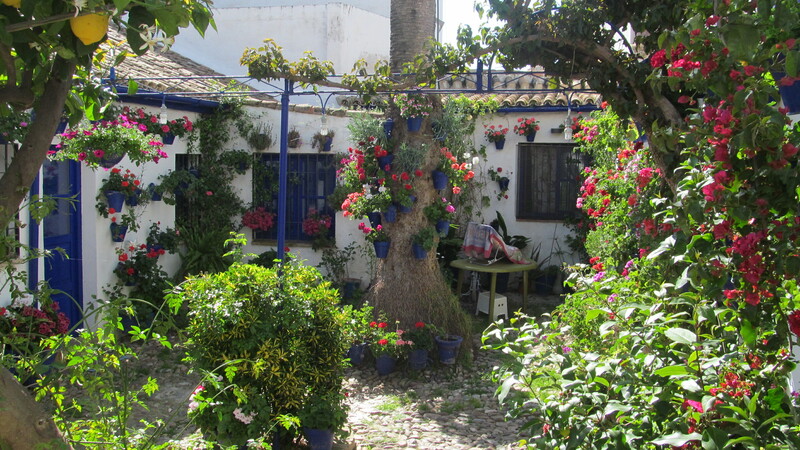 LIke the homes and villas of the Romans, Moors and other peoples around the Mediterranean. The exteriors of the home are simply white walls which reveal nothing of the life within. Absolute privacy and tranquility in the midst of a congested barrio. I took advantage of an organized tour of some patios the other evening. 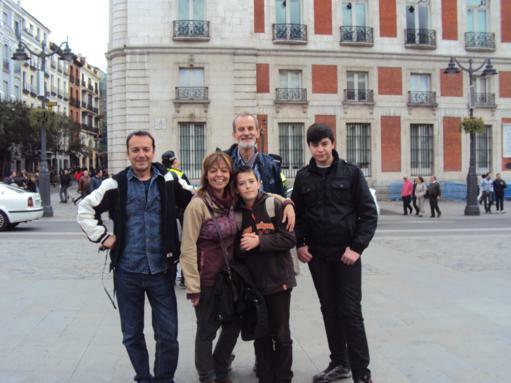 I joined my guide, Rafael, and two couples, one from Barcelona, the other from Zaragoza, both favourite cities of mine. 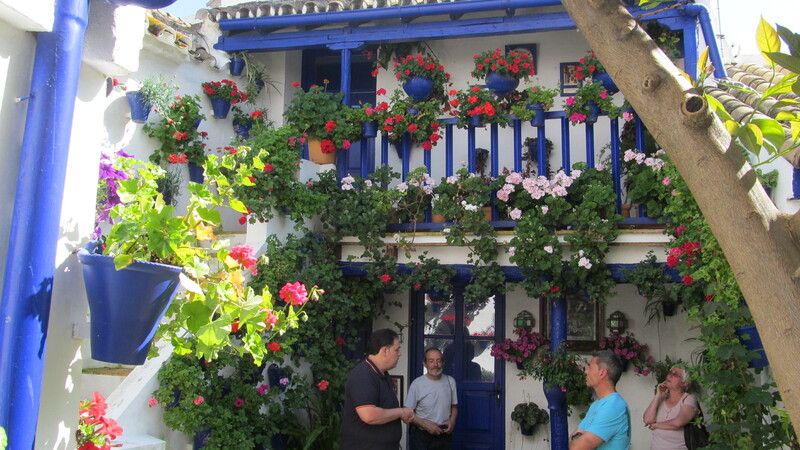 We were in a neighbourhood beyond the pale, beyond the concentration of Cordoba’s most ancient streets with its many monuments. I always like getting into the other neighbourhoods of a city, to see some glimpses of how the residents live. The first one we visited had been built in the 19th century by immigrants from rural areas. It is now gussied up, partly as a result of competitions for the most beautiful courtyard, like those for England’s most charming villages. Yes, it’s me, in my sandals. Too many geraniums and petunias for my taste. Behind me is the well for the use of this household. What genuinely surprised and pleased me was that within the confines of this small space four families lived. Their living quarters would have been small, primarily for sleeping. 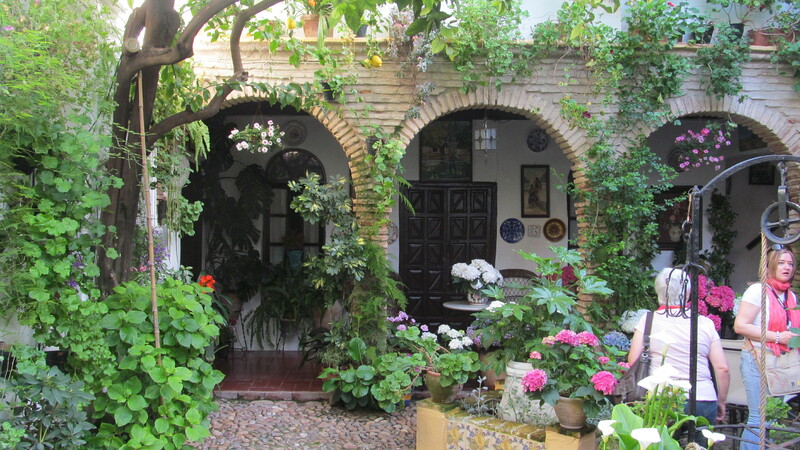 The four families, one would have been upstairs, a second on the ground floor, the other two in other corners of the courtyard, cooked communally in the patio. The intense blue is an Arab influence and is also quite common framing windows and doors in southern Portugal. A third living quarters towards the rear. 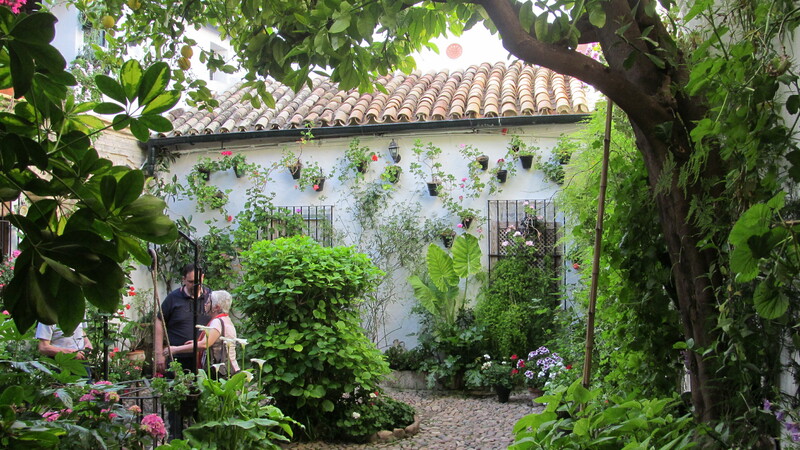 Interesting to imagine this patio without all the potted plants, with four families from the impoverished countryside living together trying to get a foothold in the city and provide for their children. The trunk in the middle is that of a lofty palm. 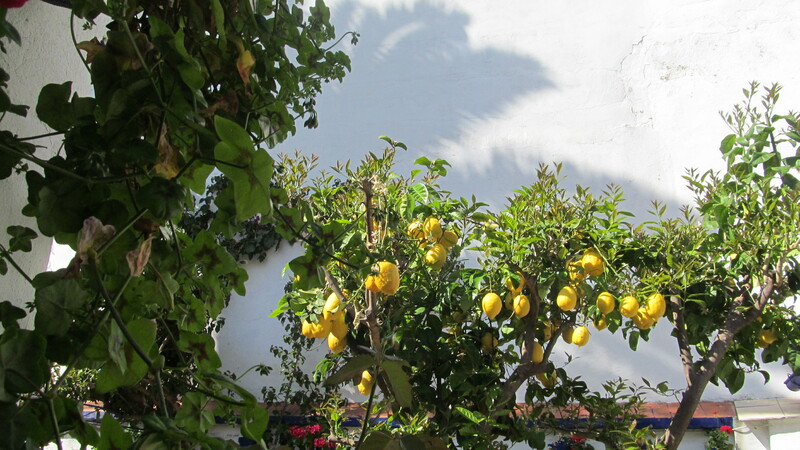 I couldn’t resist this photo, not only the enormous lemons but the shadow of that palm tree. With the door to the street closed, this is a world unto itself. And for those more prosperous, those who pass by would have had no idea of what’s within, another characteristic of Roman and Muslim domestic architecture. A second house, located in a centuries old building that might have housed up to twenty families at a time has five patios; the one we visited was difficult to capture because of its intimate dimensions, but here is some of the resident canary’s welcome and some of our constant conversation. The better video, showing the two levels, unfortunately was taken vertically by my camera and ended up on its side in the blog. One more skill still to learn. 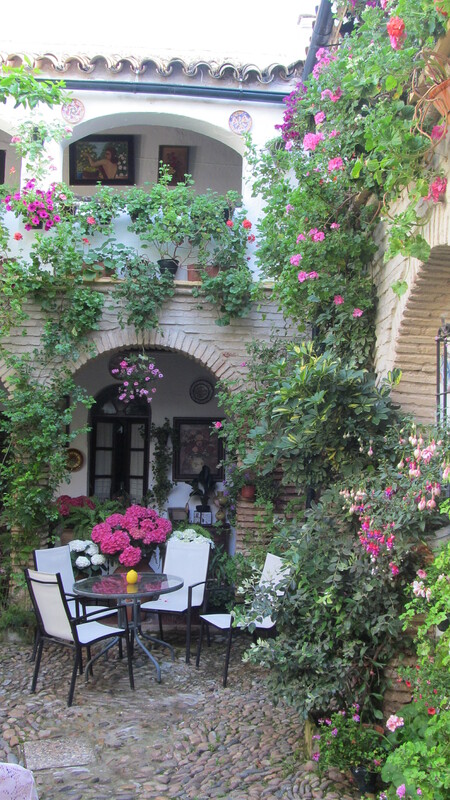 The third patio turned out to be the home of our guide, Rafael. 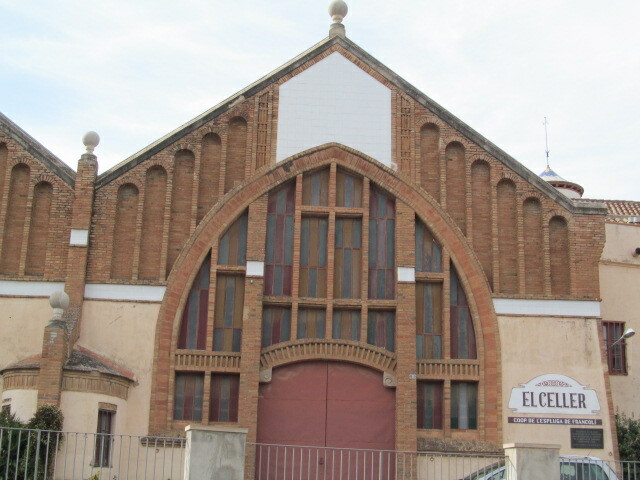 What is interesting is that it was constructed only about ten years ago, lovingly faithful to the ancient traditions. I am just inside the outer door looking down the hallway, the walls lined with some of his collection of 18th and 19th century pottery and other artefacts. What a life? 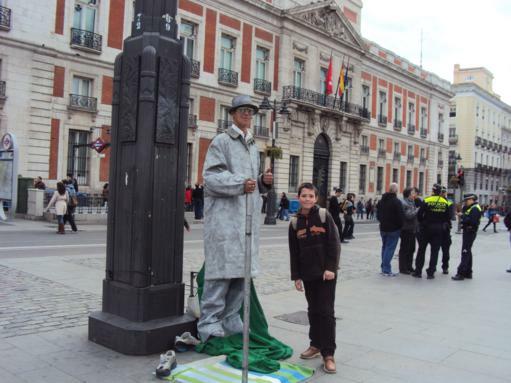 Daily tours, two hours of interesting conversation, a wonderful way to make a living and contribute to his community. In the busy months ahead, he will take up to 30 persons at a time and I am sure that he gets the crowds. Good for him! 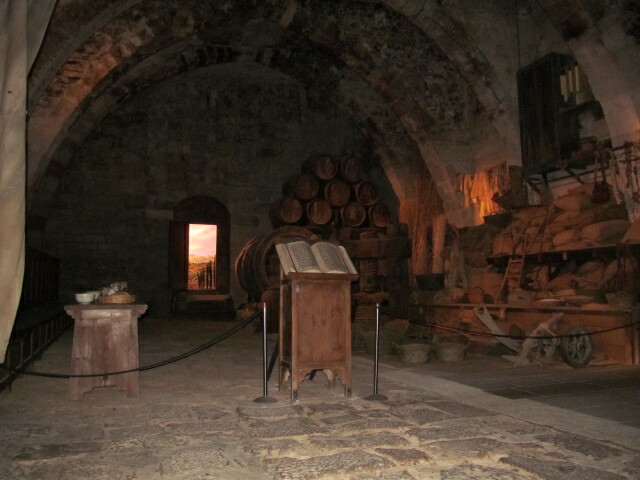 Our final one (I am leaving one out), once again in a street of walls and closed doors was built originally in the 15th century as a military barracks, and was at various times, a hospital, a convent, and then privately owned. Over the last 100 years, it has been the birthplace of a well known artist, Anna Lopez and of a much honoured poet, Pablo Garcia Baena. To the right is the top of the well which is still used for the daily task of watering all the blossoms. One final picture instead of a thousand words. 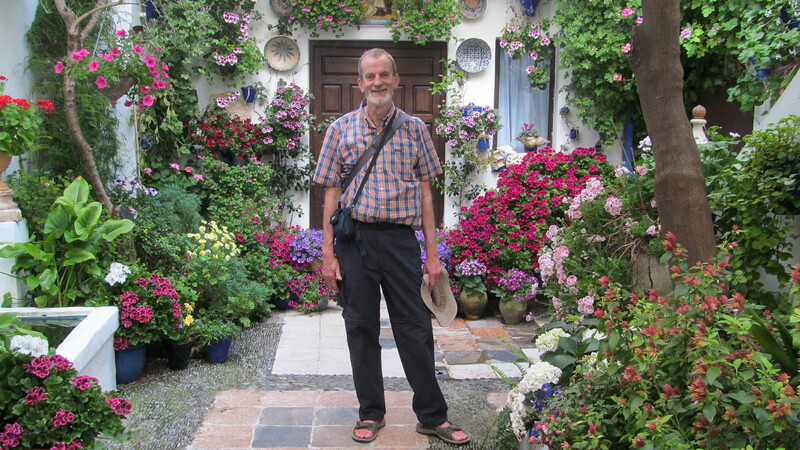 A wonderful memory from this week in Cordoba which is daily providing me with a treasury of memories. 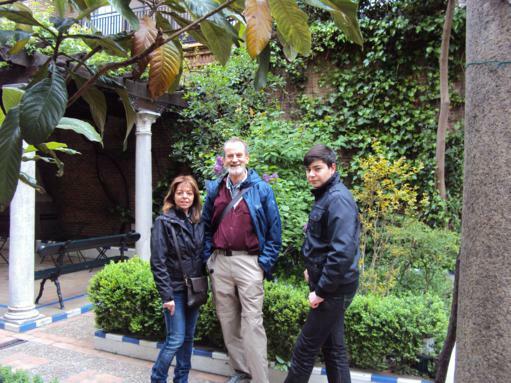 Rafael was passionate and very knowledgeable about the history of the tradition and of his neighbourhood. The other members of the group contributed well, each in their own way. This entry was posted in Uncategorized on April 18, 2013 by agnotarte. Clearly one of the wonders of the world, built during the centuries of Islamic rule in Andalusia, expanded by different rulers. An enormous size, 180 X 130 metres. 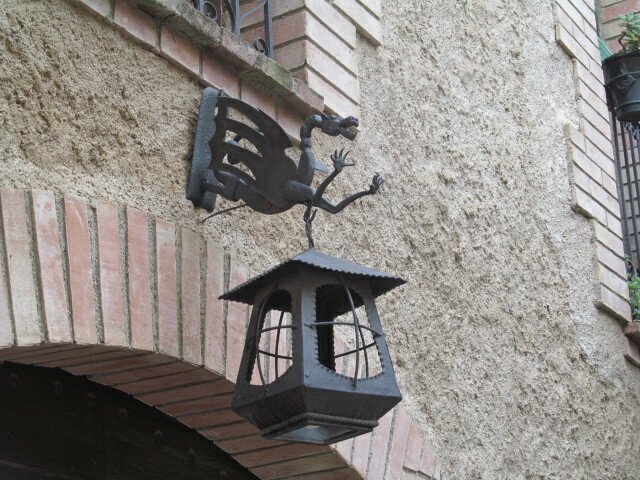 Very difficult to capture its dimensions given its location in a neighbourhood of narrow lanes. Along the sides, amazingly beautiful doors and windows, 12 in total, the doors themselves covered in brass. The intricacy is breathtaking and note the absence of human and animal depictions, celebrating the ineffable, the unknowable, Allah, in beauty and pattern. 856 columns, in marble, reused from various Roman buildings. 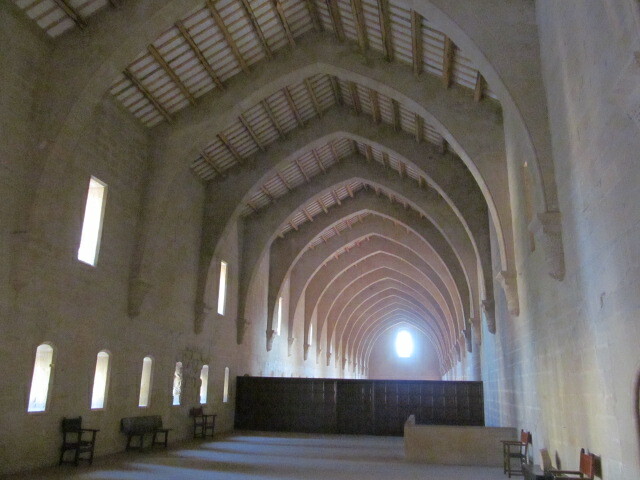 With horseshoe arches in distinctive red and white pattern; also arches on top of arches to raise the height of the ceiling. I took dozens of photos; each captures and doesn’t capture the feeling, the sensation of being in this building, this prayer room for the Cordoban community a thousand years ago. The mihrab, on the eastern wall, in the direction of mecca, to orient those praying in this direction. The prayers in Arabic around the arch; calligraphy is a key element in their art and architecture, almost invariably words from the Quran; the word glimmer in the morning light, coming through the strategically placed windows in the cupola. And the stunning cupola rising above the interior space. How about another attempt to capture the interior? 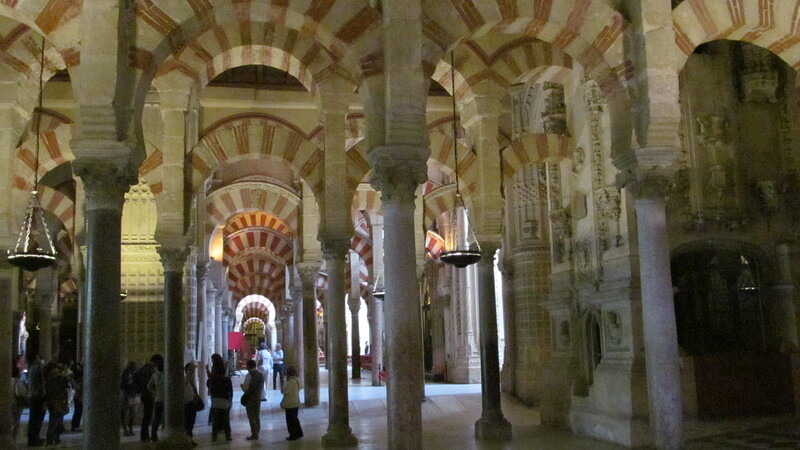 Cordoba was captured by the Christians in 1236. The residents, a mixture of Muslims, Jews and Christians, continued to live together. 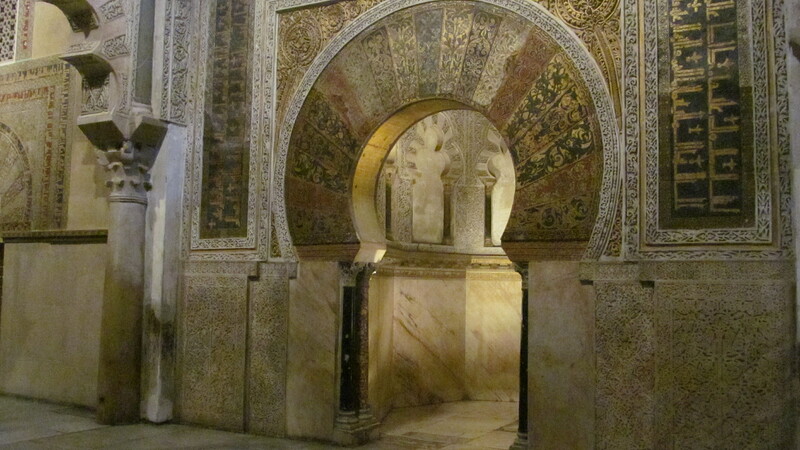 Two of the groups prayed in the mezquita; the Christians did build chapels around the exterior walls. They closed the fountains, though, the source of water for making ablutions, an essential part of the preparation for prayer for Muslims. There is some suggestion that in response to the Arab baths and the ablutions before prayer the Christians considered it holier to stay dirty; pagans bathed, they didn’t. In the early 16th century, 300 years later, 300 years after this new variety of convivencia, that a Christian church was planned to be built in the middle of the mezquita. The residents, Christian and Muslims, objected together. 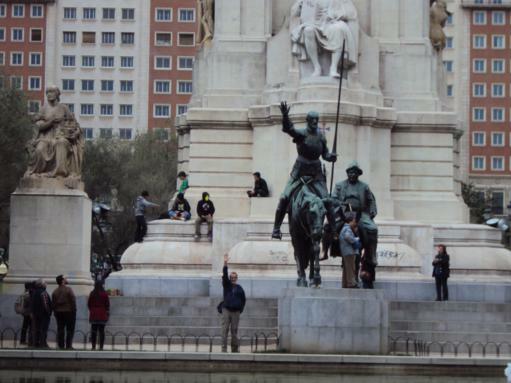 The intervention by the distant king, Carlos V, who had never been to Cordoba, made the project a reality. He came to Cordoba after it had been built and apparently said, ‘you have built what you or anyone else might have built anywhere else, but you have destroyed what was unique in the world.’ What does he mean? ‘You have built.’ He made the final decision. 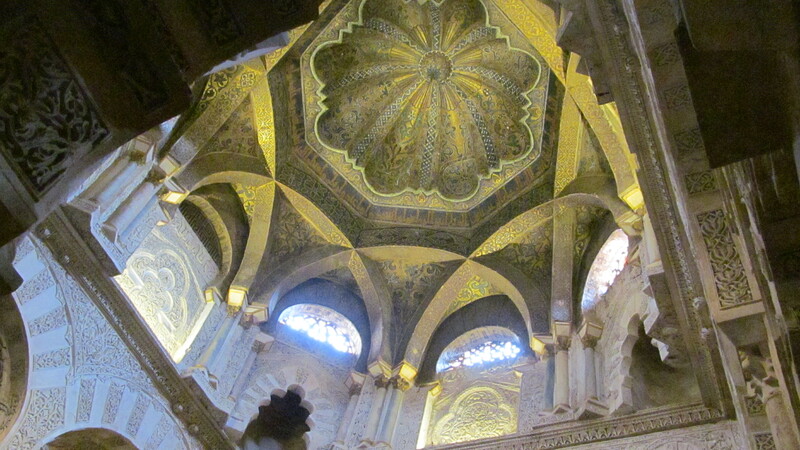 This Charlie also made the decision to build an incompatible Renaissance palace at the Alhambra. 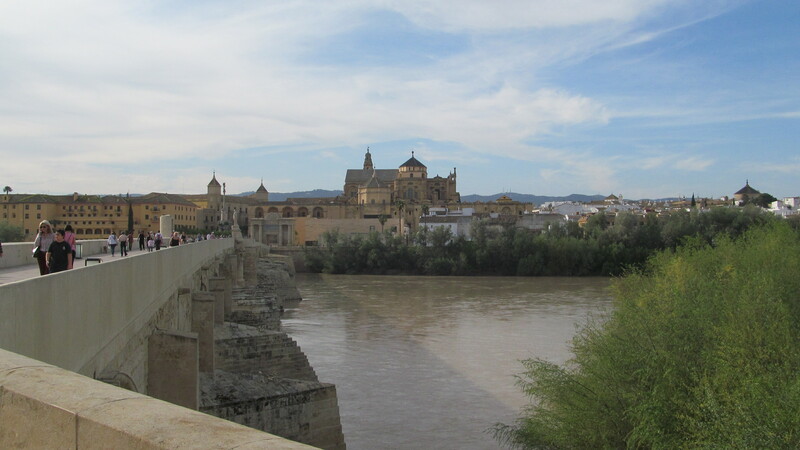 Now look at the mezquita from the Roman bridge. You have to look carefully; where the bridge ends, you will see a building of uniform height which stretches quite a bit to the right, just beyond the lower buildings near the river bank – in the first part are recognizable five rounded arches. 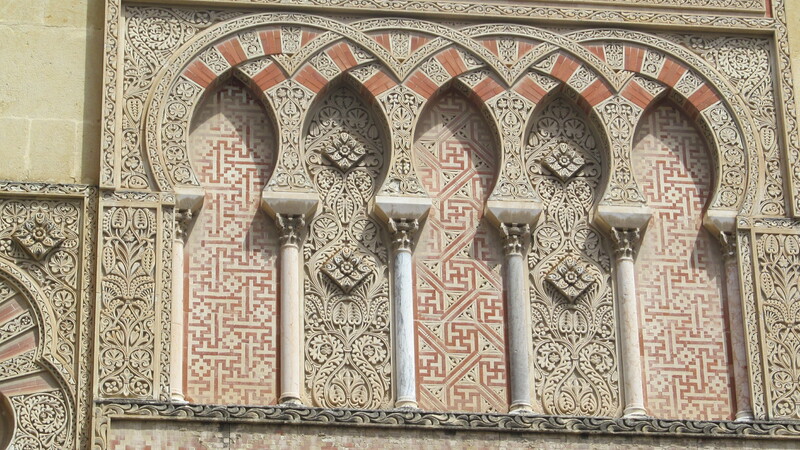 This is the eastern wall of the mezquita. Rising in the middle of the lower building, the Grand Mosque of Cordoba, is the enormous Christian church. I could easily go into a rant. I won’t. The photo speaks for itself. You can only imagine what the central part is like inside the mosque and the effect it has. An abomination! After centuries of convivencia, centuries of intolerancia. Please Francis over there in Rome, tell them to undo this. Restore the great mosque to its full original beauty. Give it back! What an opening to other faiths, to the equality of these faiths as faiths important to their faithful, the three peoples of the Book. My shortest post, but the photos tell the story. This entry was posted in Uncategorized on April 16, 2013 by agnotarte. 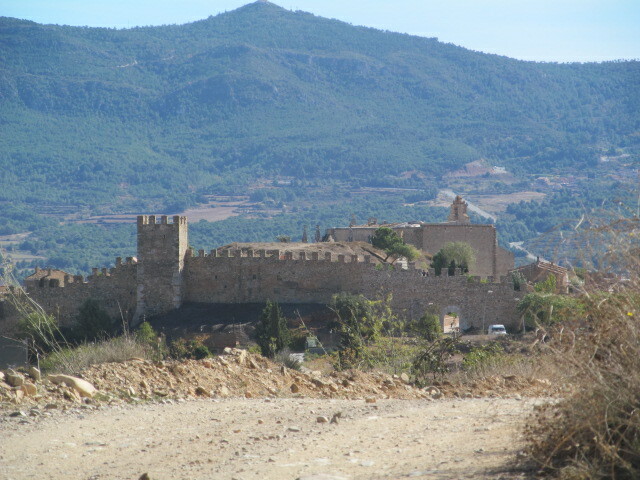 The photo I use on my site forms the backdrop of a spectacular bit of architecture from the late seventh century, the Ermita of Santa Mara de Lara de Quintanilla de Las Viñas. In my third post way back in October, I wrote about my first visit there, expecting it to be a relatively quick one, to take pictures of a site that I had read about and how that day became one of the hooks that bring me back here. 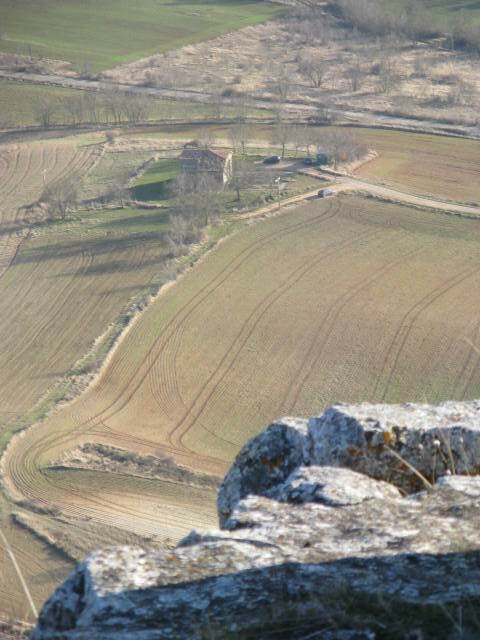 In a wonderful bit of serendipity, I ended up hanging around and climbing this chunk of rock called the Pena of Lara. If you check back, you will have the whole story including photos of my friends and me climbing on a beautiful 20 degree February afternoon. 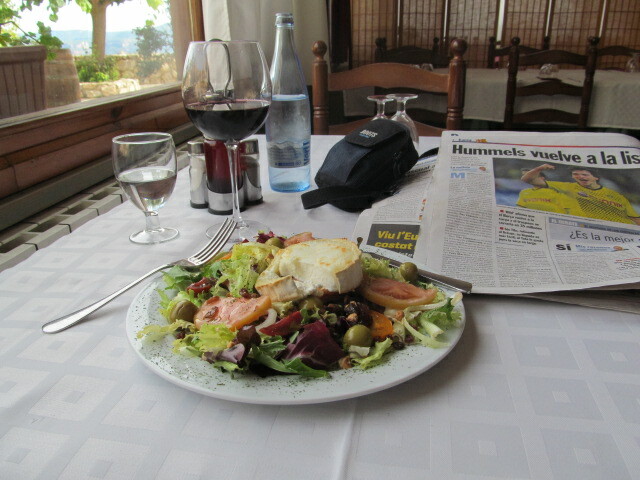 That same day found me in the Casa Galin, a small hotel in a nearby historical village where I am now writing this post. 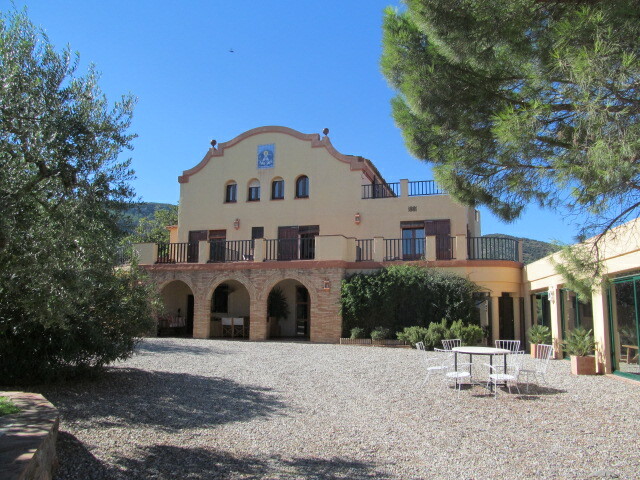 It is my home away from home in Spain. I am welcomed back each time and recognized by some of the villagers. 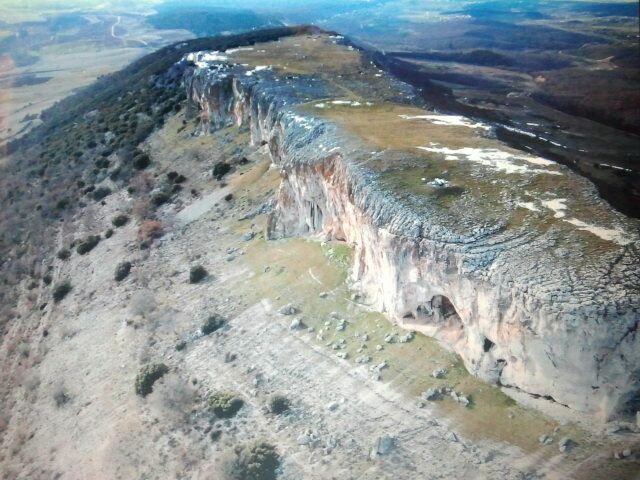 Trusting that you have checked back and seen some of the lay of the land, I present you with a photo of where I was standing at the end of our hike up, taken recently by a friend of Antonio (he is the guide at the church, my friend) a hang-glider. Yes, that is snow. The church was probably a small monastery built by aristocratic patrons in the decades just before the arrival of the Moors in 711. 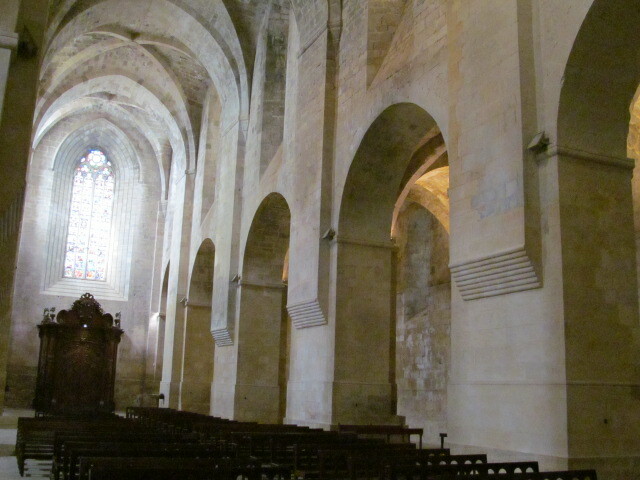 Only the apse and crossing survive; the nave would have collapsed at some point after the building had been abandoned and the stones taken to be used in other constructions. Look at the day – almost 20 degrees perfection! Like my first day here. The tiny apse has three levels of remarkable friezes on the exterior; using such a high level of ornamentation was a traditional device to emphasize the importance (in Spanish, you would say la transcendencia) of this part of the church, the apse. Each level conveys a different message, the importance or transcendencia of the frieze grows from the lowest to the highest. The first level is a simple series of rolls with palm leaves and grapes or dates alternating. The palm leaf was a popular motif – the classical Roman symbol of victory here adapted to signify the victory of those faithful to Christ. 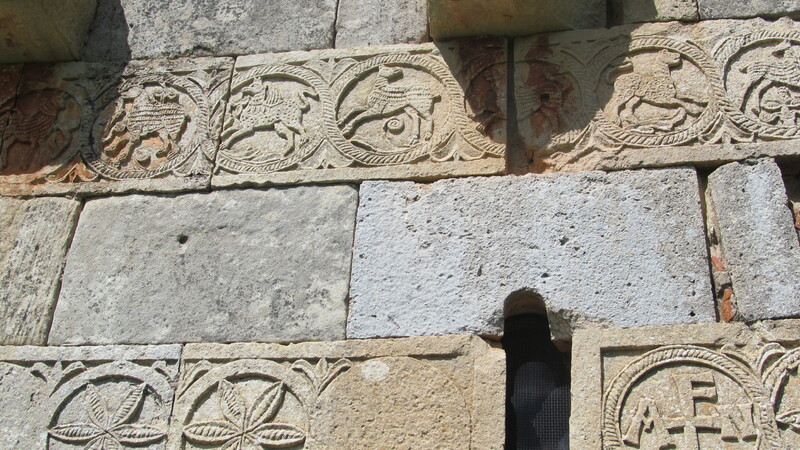 The shell signified someone or something of importance, of trascendencia, and in this case, the doorway to the apse. The second level is more refined, a procession of birds, another symbol adapted from Roman art, symbolizing the procession of the souls. In the mix, the tree of life. The upper level is a series of 10 animals, arranged from the middle moving outwards in pairs: lions (male and female), deer, griffins, possiby bears, and a type of cattle. Each has theological signifcance for the medieval mind. The lion is incredibly ambiguous, the king of beasts like Christ is king of the world, and at the same time, a dangerous animal who could tear you apart, like the devil who could destroy your soul. The medieval people also believed without question the legend that newborn lions were born either dead or blind, were kept in a cave by the female and on the third day the male entered and brought them to life or gave them sight by licking them – all symbols of the saving power of the water of baptism and of Christ’s resurrection from the cave (tomb) on the third day. A curious doorway into the medieval mind! The style of the sculpture is refined, sophisticated, almost unknown at this time anywhere in Europe although we only have what has survived for comparison, the influences most likely from the Middle East. Inside is another story, a very different style, almost as if the work had been done by children, deeply carved, two-sided in parallel lines. 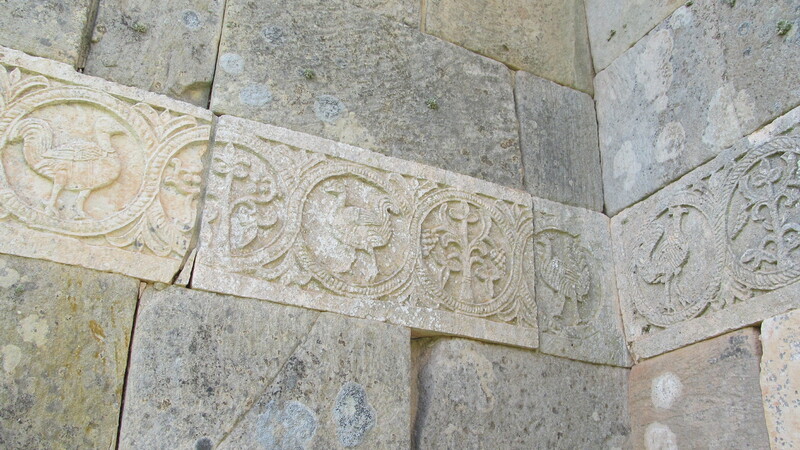 At the entrance to the apse, columns (reused from a Roman building) and imposts – a large type of capital. On the right, flanked by two angels, Christ as the sun, the rays emanating from his head borrowed from classical portrayals of Apollo, the Roman sun god. 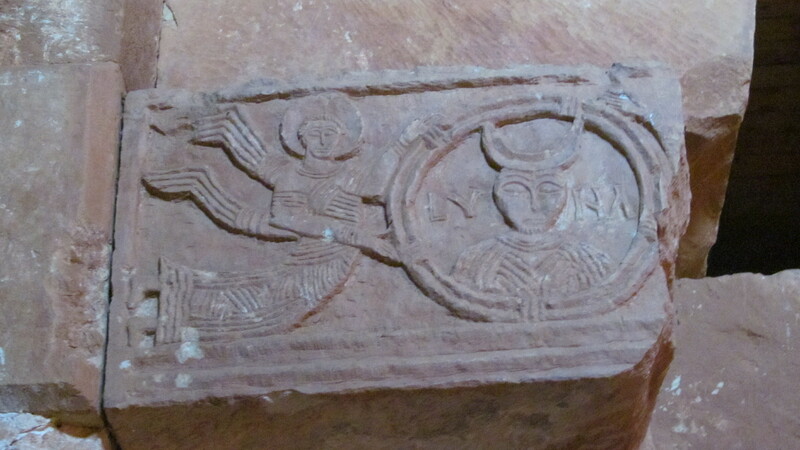 On the left, Christ as the moon. 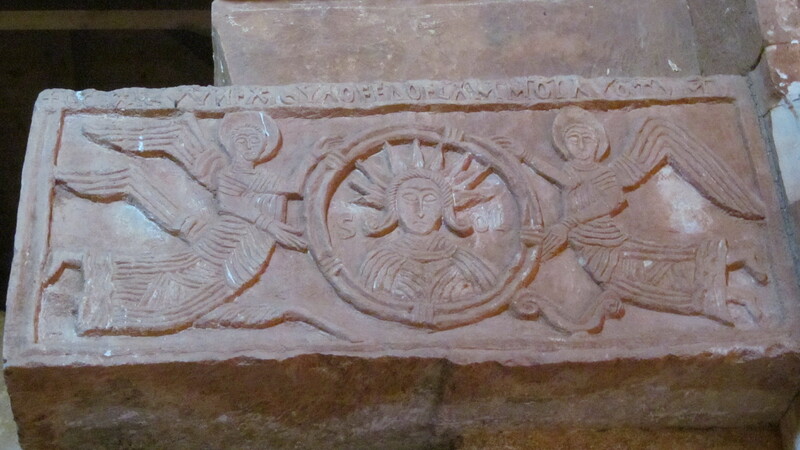 I have found this motif in a variety of other places in churches in Spain. Source? Very simple, John’s Book of Revelation, one of the key books of the New Testament in medieval Spain, giving insight into their obsession with the coming Apocalypse. John writes that Christ is the sun and the moon, the alpha and the omega. To the left and right of Christ as sun god, you can see the Greek letters for the alpha and the omega. The two very different styles – the same or different workshops? “Well, I have a theory, it is my theory, and mine alone.” Thank you, Miss Ann Elk. I shall take over now. 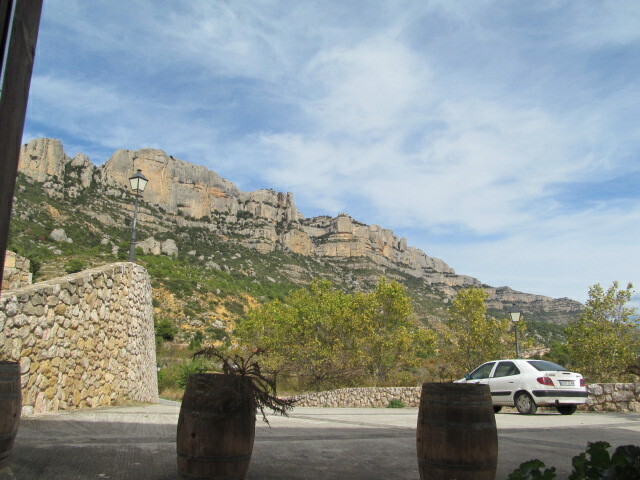 A couple of years ago, at the end of a day, Antonio and I went for a couple of hours walking through the hills. We returned at dusk and reopened the church. I came with a supply of candles and saw these more simply carved sculptures in candle light and it all made sense, at least to me. In the early morning darkness before the sunrise, the time of mass, the effect of the candles on these Christ figures would have been extraordinary, particularly for the lay people in the nave, the shepherds – reinforcing, reinforcing the divinity of Christ in the eyes and hearts of these uneducated ones who would have had a very rudimentary sense of what their faith was all about. 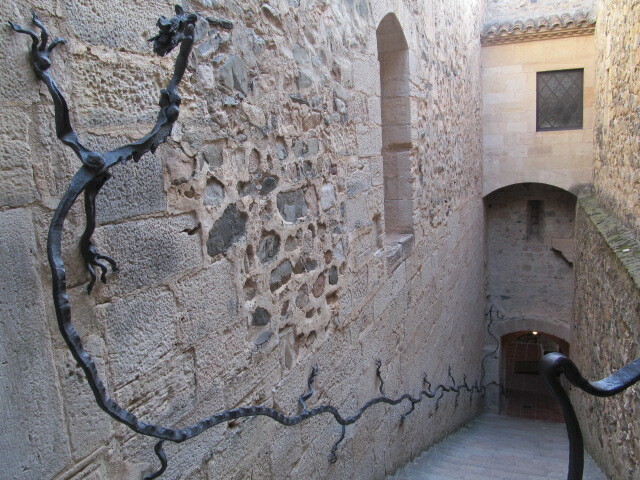 Two different purposes for the sculpture – the ones outside and the ones inside; therefore, two very different styles done by the same team of sculptors. At home, I actually have some short videos of the candlelight working on these imposts. One final shot, of the ermita from up top, taken that day in February 2009 before we made our descent. On this beautiful Saturday (yesterday), with spring clearly here, I spent the afternoon chatting with visitors to the ermita (Antonio is bored after too many years of doing this), discussing its history and sculpture. Great conversation, even debate; one visitor had nothing but disdain for the architecture from this period. I had fun convincing him of its value and worth, or least, trying to convince him; you know how these Gothic freaks can be! 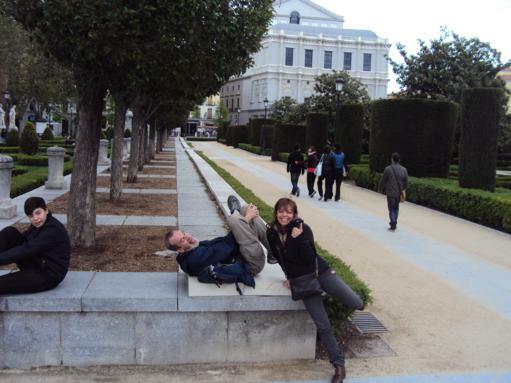 My brief life as a tour guide. Yikes, my longest post so far. No apologies; this could have been much longer. I barely touched the material in this tiny church. Count your blessings! This entry was posted in Uncategorized on April 14, 2013 by agnotarte. 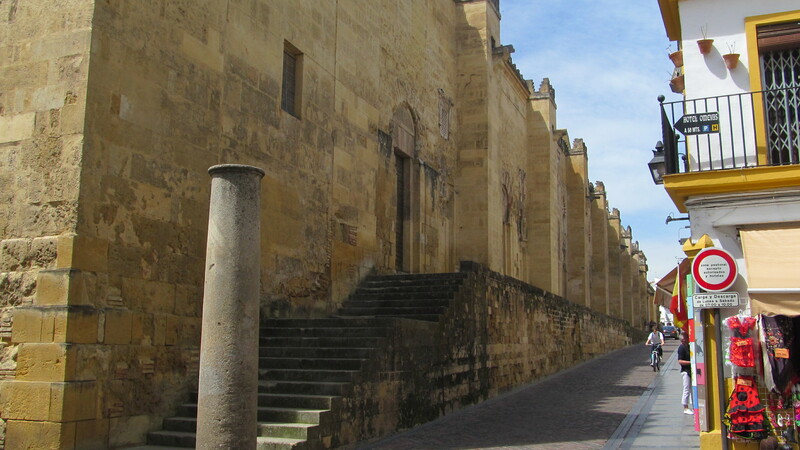 The historic centre of Salamanca is a labyrinth of narrow passageways, a pedestrian paradise,, with limited vehicular traffic, primarily for deliveries in the morning. 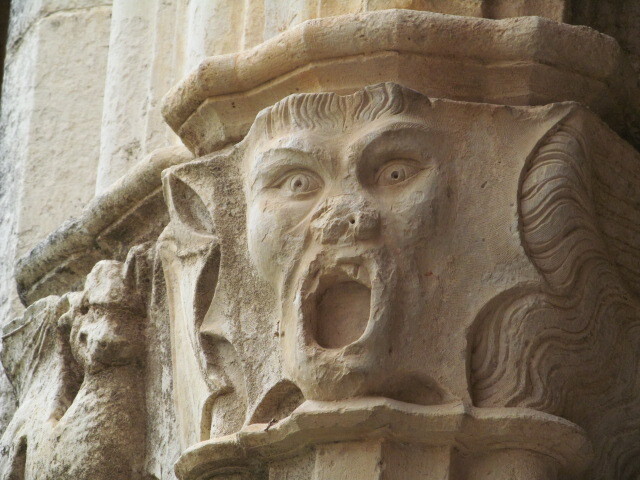 Salamancans are clearly the benficiaries of their medieval origins. Along one of these lanes, I spotted the most amazing narrow building. It is being held up by girder supports. It is now a copy shop and obviously sells soccer jerseys. (I am not writing this special post because there is a Leo Messi, No.10, jersey for sale.) 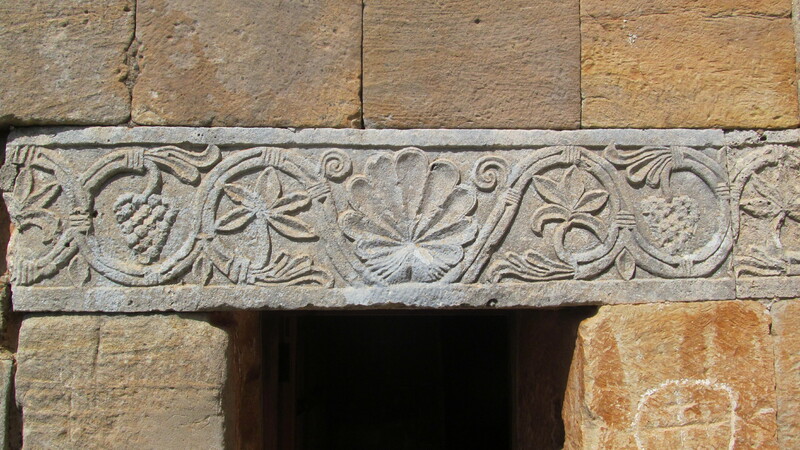 But look at the first level, horseshoe arches with the decorations that only make use of vegetal and geometric designs, with an absence of animals or humans, so characteristic of Islamic art. And within the one of the right, a metal grill with the Star of David. Was this part of the original design? The second level also amazes. 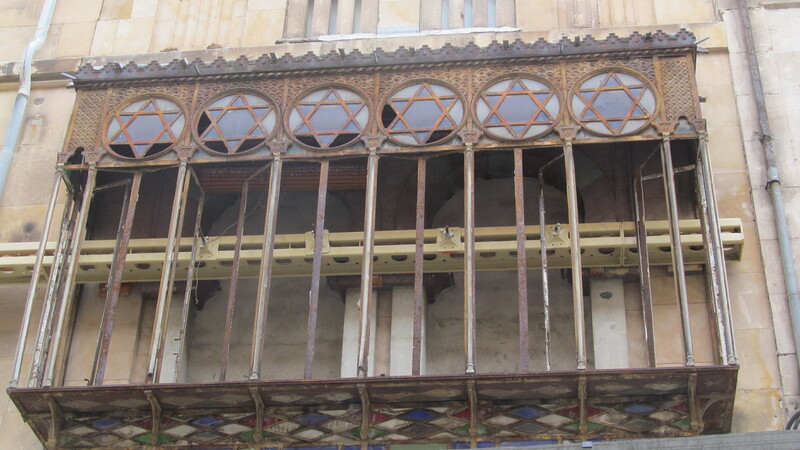 The metal frame of a window, in the style that is still so prevalent throughout Spain (remember my post on the balconies of Barcelona) with a row of six Stars of David. 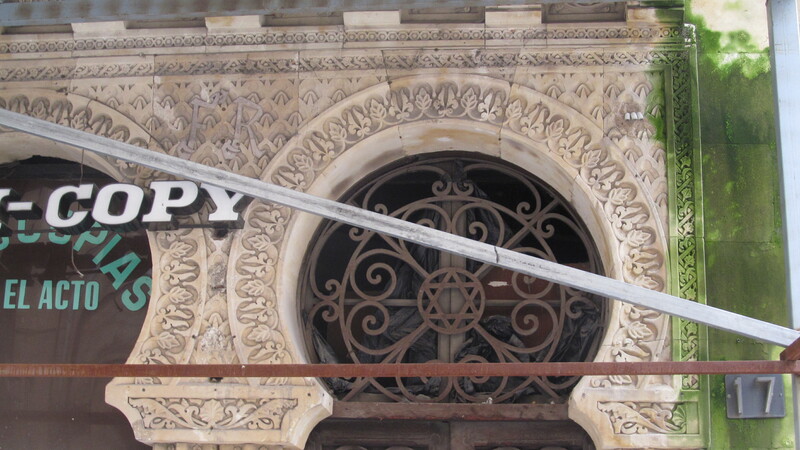 Notice the glass work on the bottom side of the window frame. I asked at the tourist office, even showed them my photos and they knew nothing about it. I know that there was a very vibrant Jewish community in Spain from as early as the second century. I also know that during the centuries of Moorish rule, the three different People of the Book, the Muslims, the Jews and the Christians, lived together in harmony, mutual tolerance and artistic and intellectual stimulation. 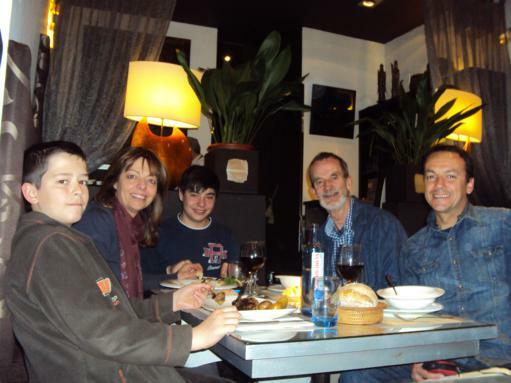 The period is known in Spanish as la convivencia. Is this the house of a Jewish family? A bit of research tells me that this street is within the area of the Judaria, the Jewish neighbourhood in medieval times. The Jews were expelled finally in 1492. Quick test? What else of significance happened in Spain in that year? Top marks if you said the final victory over the Moors by Isabel and Ferdinand in their capture of the kingdom of Granada. Yes, I know that there was something else. 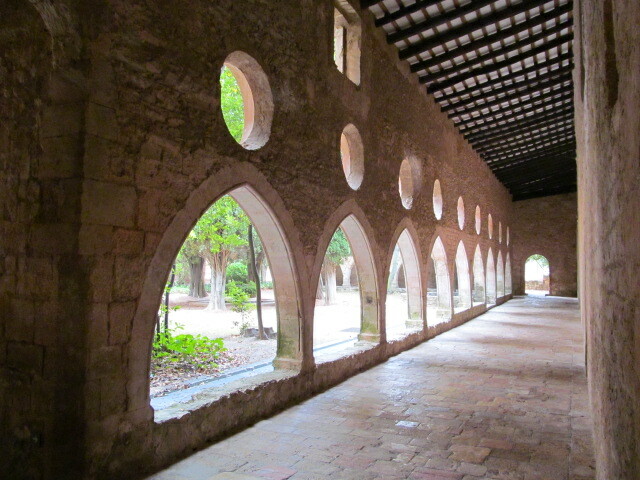 If it was the home of a Jewish family, did this family have it built with the horseshoe arches, an essential element in Moorish architecture. 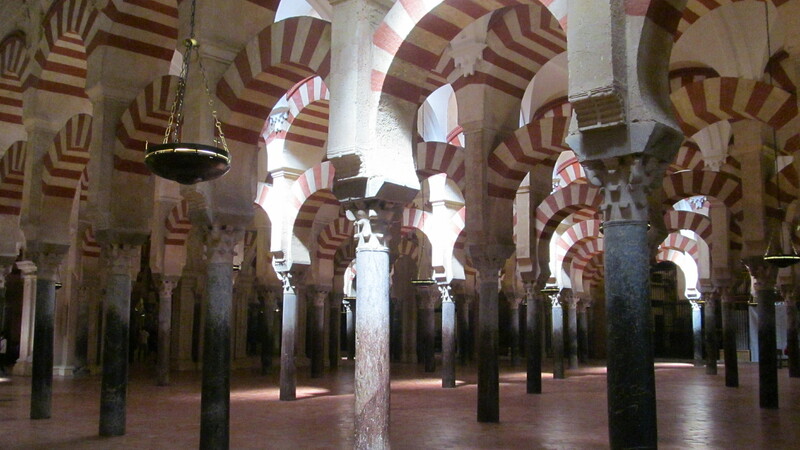 Think of the Great Mosque of Cordoba. 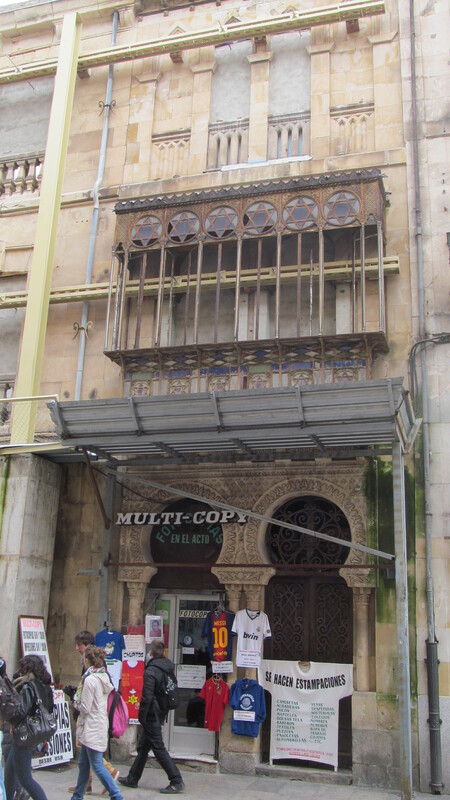 There is a medieval synagogue in the city of Toledo which is clearly inspired and imitative of Moorish architecture, the decision to build like this made by the Jewish community. 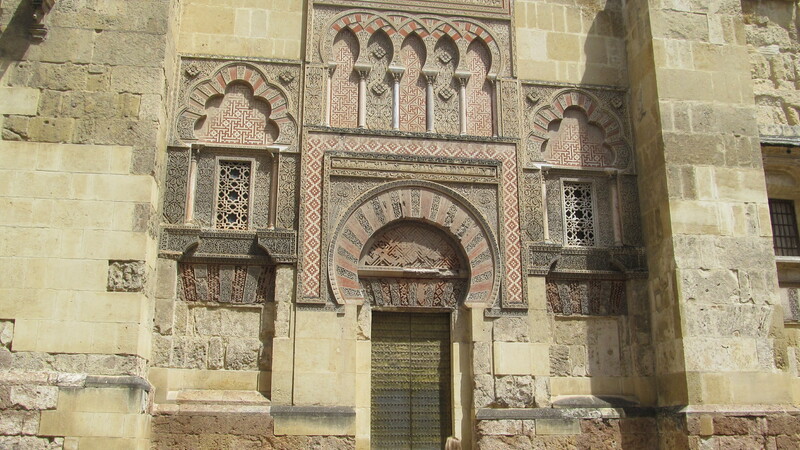 I am heading back to Toledo at the end of the month to take another look at a Christian church which reflects clearly the same Moorish influence. And I am left with the growing sense that the Christians and the Jews thrived within and under the influence of the civilization that the Moors developed in Andalucia, their name for Spain, and that their admiration and appreciation of the centuries of convivencia was reflected in their own architecture, to the degree that they chose to build using the styles of the group who dominated politically and militarily but stimulated artistically and intellectually. At times, the Christians chose to build in the Moorish styles rather than in the dominant Chrisitan (that is, the rest of Europe) styles. Interesting, provocative! 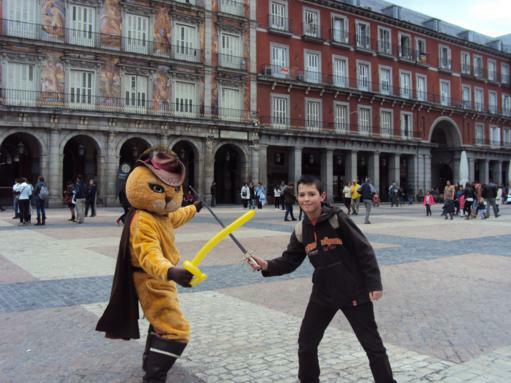 Another reason why Spain is such an intriguing place to visit. 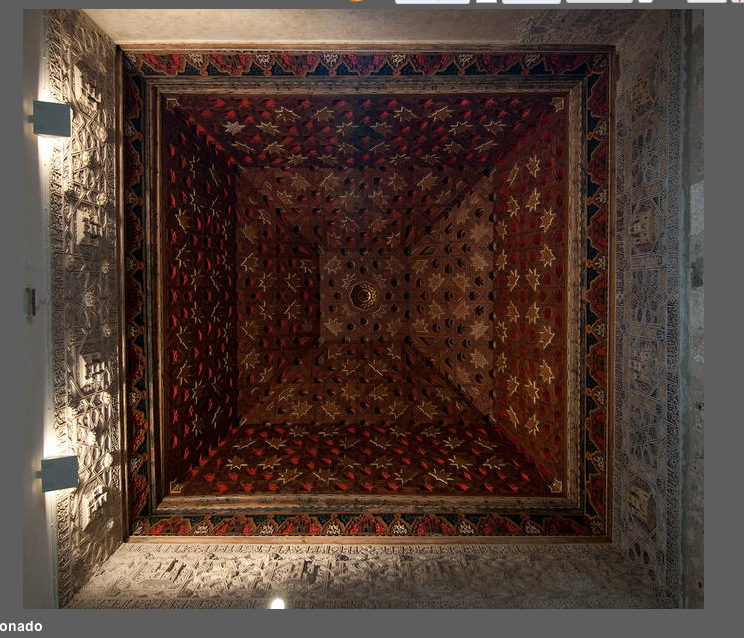 I visited a monastery yesterday in Burgos; a small chapel has an amazing wooden ceiling – Islamic and chosen to be decorated in that style by a Christian king. I have finally found a photo of it on the Web. Forgive the grey border from the site where I located it. The jaw drops in the presence of such beauty! Food for thought as I nibble on my plates of tapas! Something to pursue when I return to Toronto and the Robarts Library with its magnificent collection of texts on Spanish art and architecture. This entry was posted in Uncategorized on April 13, 2013 by agnotarte.